How do I obtain an API access token in the Canvas Data Portal? 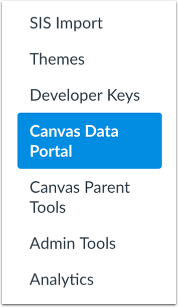 The Canvas Data API allows you to get information about or download Canvas Data files. Any Canvas Data admin can generate API credentials, but the credentials are shared between all admin users in that account. If you would like to grant access to other users or third-party partners to download files via the API, you can generate credentials and securely pass them to those users. However, if you need to revoke access for a user, you will need to regenerate the credentials and securely distribute the credentials again. In Account Navigation, click the Canvas Data Portal link. Click the Create Credentials button. Copy the API Key and API Secret. If you return to the Credentials Portal, you will be able to see the API Key but not the API Secret. You can create new credentials by clicking the Create Credentials button. However, generating new credentials will invalidate the old credentials for all users who have access to them. Previous Topic:How do I use Canvas Data files? Next Topic:How do I use the Courses page in an account? Table of Contents > Canvas Data > How do I obtain an API access token in the Canvas Data Portal?